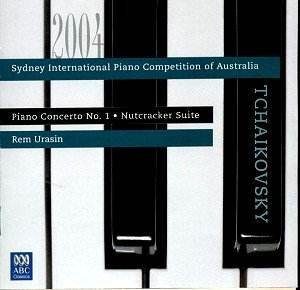 ABC has been releasing some examples of Sydney�s International Piano Competition in their piano-striped booklet livery; I�ve reviewed a past competition on this site but now we�re pretty well bang up to date with performances from July 2004. Rem Urasin was born in Kazan in Russia in 1976, studied with Lev Naumov in Moscow and has made a number of recordings. Like many young pianists he�s done his fair share of competition rounds � Warsaw and Monte Carlo amongst them � and received second prize at Sydney as well as a clutch of Best Performance and Listeners� favourite awards. He certainly chose a Moscow warhorse with the Tchaikovsky and we can hear him in heroically close-up perspective. The orchestra, unfortunately, whilst somewhere in the Sydney Opera House is not that audible on disc. This is one clearly for the pianist�s admirers. Urasin starts rather cautiously and there is a lack of precision in some of his runs; the occasional dropped note hardly matters. Whether as a result of the too-close perspective or not his tone is rather brittle and things tend to hang fire in the first movement. One can see why his won the Mozart prize if his slow movement is any indication � lyrical and humorously done and he gets a rousing cheer at the end of the finale. Coupled with the Concerto is the Concert Suite from The Nutcracker in Pletnev�s persuasive and captivating arrangement. ABC has shown service to Pletnev-Tchaikovsky in the past and it�s well merited, not least when János Fürst is at the helm. Sound quality here is much better.